Six years ago (how time flies! ), I focus stacked the underside of a small springtail, roughly 1 mm total length extended. The original posting is HERE. I was prompted today to revisit that posting, and it occurred to me that the stack could now be re-rendered as a stereo pair to show more clearly the groove that we pretty much had to just imagine in the earlier photos. That turned out to be simple using the synthetic stereo capability of Zerene Stacker. Here are the results (crossed eyes). Rotated 90 degrees so as to allow larger display and better resolution of the groove. It's interesting to note that this pair of images in different orientations would have been difficult to produce using the traditional approach of shooting from two different viewpoints. 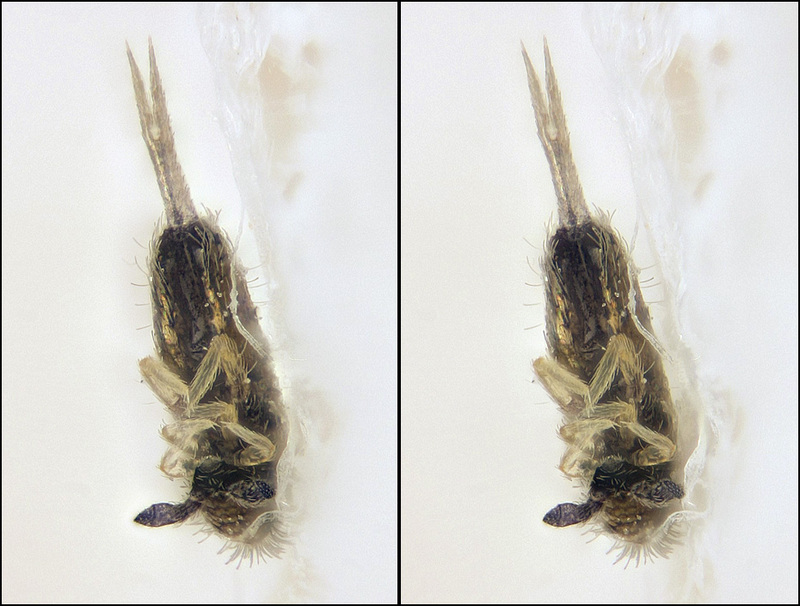 That's because the pair with the springtail oriented horizontally requires two views displaced along the axis of the subject, while the pair oriented vertically requires two views displaced across the axis of the subject. Using synthetic stereo, this is just a matter of reprocessing with different values for the shifts, rather than going back to the original subject and reshooting from different positions. I can't definitely see any scales so I say it is an entomobryid but cannot identifiy it to genus.